“We wanted to share with the r/bitcoin community that Zynga Inc. (NASDAQ: ZNGA) is now conducting a Bitcoin test with BitPay (https://bitpay.com/), a leading Bitcoin service provider, in select Zynga.com web games. 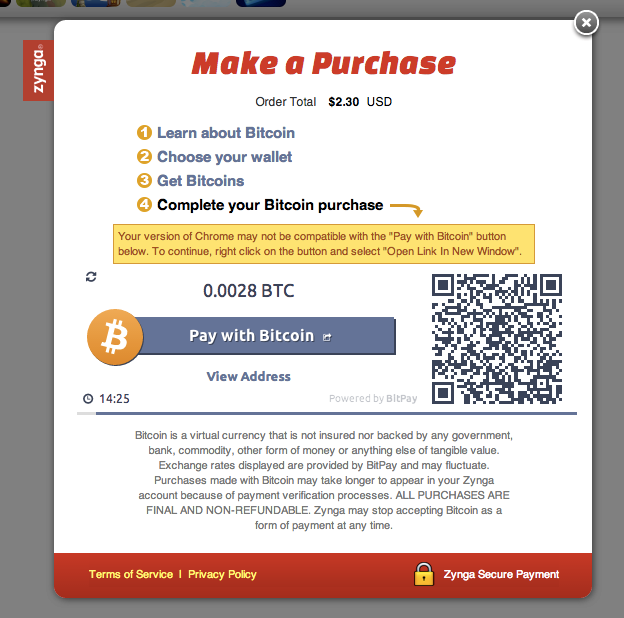 “In response to Bitcoin’s rise in popularity around the world, Zynga, with help from BitPay, is testing expanded payment options for players to make in-game purchases using Bitcoin. The Bitcoin test is only available to Zynga.com players playing FarmVille 2, CastleVille, ChefVille, CoasterVille, Hidden Chronicles, Hidden Shadows and CityVille. The games can be accessed at http://zynga.com. TechCrunch UK correspondent Ingrid Lunden has verified that the transactions are available, at least in the UK.